The three phase transformer windings can be connected several ways. Based on the windings' connection, the vector group of the transformer is determined. The Determination of vector group of transformers is very important before connecting two or more transformers in parallel. If two transformers of different vector groups are connected in parallel then phase difference exist between the secondaries of the transformers and large circulating current flows between the two transformers which is very detrimental. The Star connection is also called Wye as it resembles the English letter 'Y'. As both the names Star and Wye are equally used we have the freedom to use them interchangeably. Of course some people also use the term 'Mesh' in place of 'Delta'. Let us first consider the Wye - Delta type where three primary windings are connected in Wye and the three secondary windings in Delta. For this whole article you have to remember few points below to enhance learning. It is applicable for both single unit type and single-phase bank of transformer type. The windings A1A2 and a1a2 are wound on the same limb of core. So also the other two sets of windings. (In case of 3-phase bank of transformers the two windings correspond to same single phase transformer). The primary and secondary windings on the same limb of the core are shown with same color. The windings on Delta and Star sides are diagrammatically rearranged in Delta and Star like shapes(according to connection) respectively just to enhance learning. The voltage developed in the windings shown with same color(placed on same limb of core) are in phase(or zero phase displacement). Hence the corresponding phasors are drawn parallel to each other. The windings in the primary are connected in Wye(Star) and the secondary windings are connected in Delta. In the primary side the three windings are A1-A2, B1-B2 and C1-C2. Similarly the three secondary windings are a1-a2, b1-b2 and c1-c2. It should be noted that both the windings A1-A2 of primary and a1-a2 of secondary are wound on the same limb of core. The naming of the terminals has been done according to their polarity. Other wise you can imagine that when A2 is positive with respect to A1, then also a2 is positive with respect to a1. Think similarly for the other windings. See carefully the diagram below. A2,B2,C2 and a2,b2,c2 are respectively the primary and Secondary side terminals taken out side of transformer. In the primary side the three windings are connected in star. So we have shorted A1, B1 and C1. This is the primary side (star side) neutral 'N'. In the secondary side the three windings are connected in delta. Here windings a1-a2 and A1-A2 are wound on the same limb of the core, so the corresponding voltage waves are in phase. Hence we have drawn a1-a2 parallel to A1-A2. 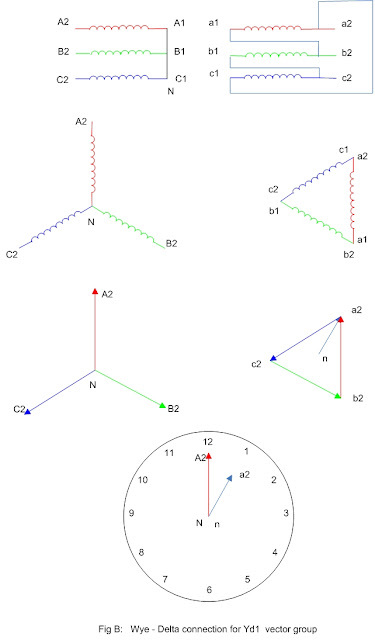 similarly windings b1-b2 is drawn parallel to B1-B2 and c1-c2 drawn parallel to C1-C2. To see the actual physical placing of the windings on the core limbs of transformer see my (archived) article Three PhaseTransformer Basics. There also you can find one example for a bank of three single phase transformers used as three phase transformer. 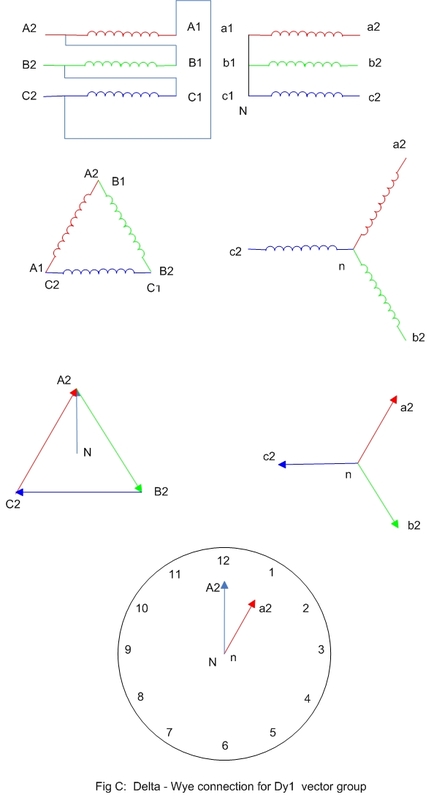 In the phasor diagrams we have drawn primary side voltage phasors A1A2, B1B2 and C1C2. 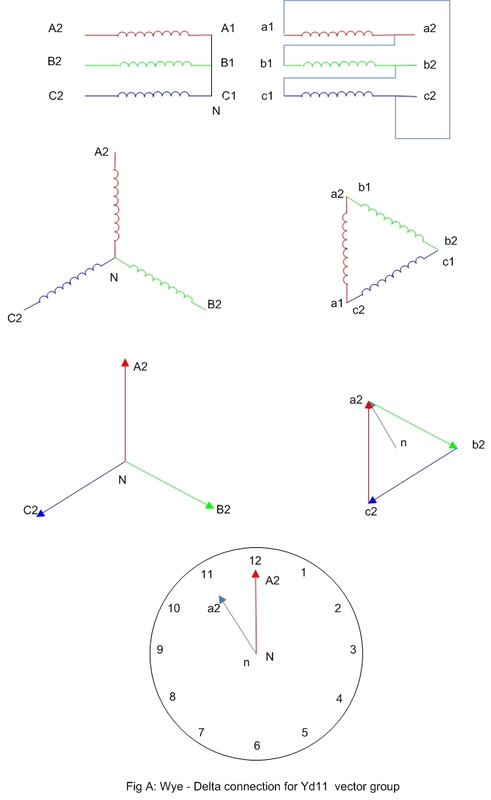 As usual for three phase system, these are the phasors displaced 120 degree from each other.Similarly in the secondary side voltage phasors a1a2, b1b2 and c1c2 are drawn. Just observe that a1a2 is parallel to A1A2, b1b2 is parallel to B1B2 and c1c2 is parallel to C1C2. I repeat here, that, this is because a1a2 and A1 A2 are in phase (as they are wound on the same limb of core). Similarly b1b2 and B1B2 are in phase and also c1c2 and C1C2 are in phase. In the delta side we have so arranged that the phasors form the Delta. 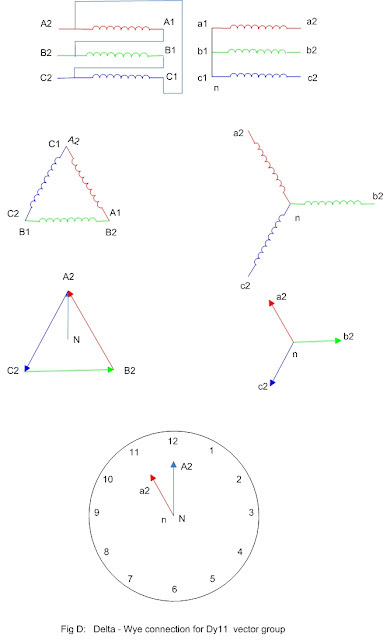 In the winding connection diagram a2 is connected to b1 so in the phasor diagram a2 and b1 are joined. Similarly by joining other two phasors according to their winding connection, we will automatically get the above phasor diagram. The neutral (star point) physically exist in the star side . In the delta side physically the neutral point does not exist so it cannot be brought out. 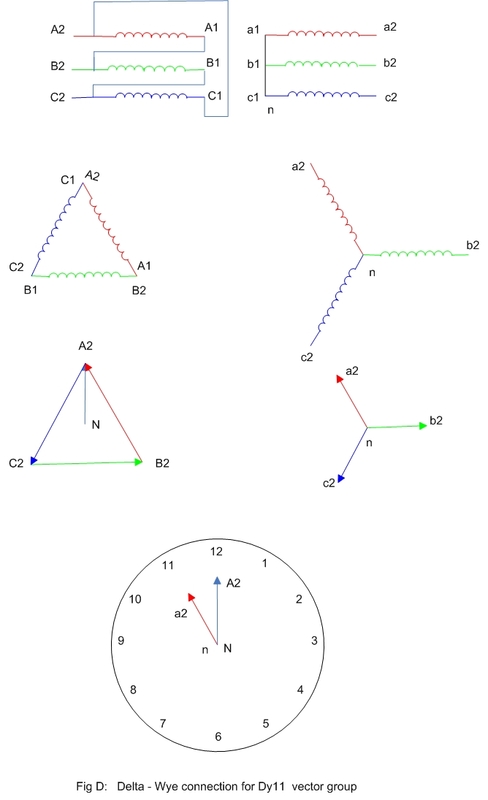 The delta side neutral is the imaginary point 'n' (geometrically found) which is equidistant from a2, b2 and c2. c2a2, a2b2 and b2c2 are the line voltages in secondary delta side. So na2, nb2 and nc2 are the phase voltages in secondary side. Now compare the primary side vector diagram and secondary side vector diagram. From the diagram it is clear that as if the secondary side phasor triad has been rotated counterclockwise with respect to primary side. From the geometry it can be confirmed that this angle is 30 degree. As the phasors are rotating counterclockwise, so the secondary side phasor a2n (phase voltage) lead the primary side phasor A2N (phase voltage) by 30 degree. 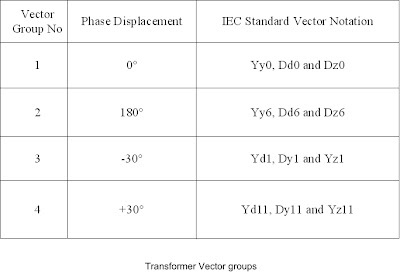 The transformers are classified into different Vector Groups depending on this phase difference between the primary and secondary sides, obtained due to different connection philosophy. IEC has devised the standard code for determination of transformer vector group. According to IEC the code for vector group consist of 2 or more letters followed by one or two digits. The first letter is Capital letter which may be Y, D or Z, which stands for High voltage side Star, Delta or interconnected Star windings respectively. The second letter is a small letter which may be y, d or z which stands for low voltage side Star, Delta or interconnected Star windings respectively. The third is the digits which stands for the phase difference between the high voltage and low voltage sides. From the above three points, the first two are quite straightforward. The third one follows the clock convention as described below. In this convention the transformer high voltage side phase voltage (line to Neutral) represented by Minute hand is fixed at 12 O'clock position and the low voltage side phase voltage (line to neutral) is represented by the Hour hand which is free to move. Clearly when the minute hand is fixed at 12 position the hour hand can take only twelve numbers of discrete positions 1, 2, 3 ... upto 12 (think it twice). The angle between any two consecutive numbers in a clock is 30 degrees (360/12). Hence the angle between hour and minute hands can only be multiples of 30 degrees. See the figure. Note: Remember that in star and zig-zag connection the neutral point exist physically and in delta connection the neutral does not exist physically and called virtual. But the line to neutral voltage can always be calculated algebraically/geometrically. Now back to our discussion of Star-Delta transformer. We have already shown that the low voltage secondary side phasor a2n leads the high voltage primary side phasor A2N by 30 degree. (remember that the comparison is between the phase voltages). According to the clock convention this specific case represent 11 O' clock. So the above transformer connection can be represented by the symbol Yd11(or YNd11). N or n may be used for a brought out neutral. Here we will keep the material simple and will not mention the neutral symbol. Let us change the connection slightly to get the Yd1 vector group. See Fig-B, here the primary side is as before, but in the secondary side a1 is connected to b2 etc. (compare with previous diagram). 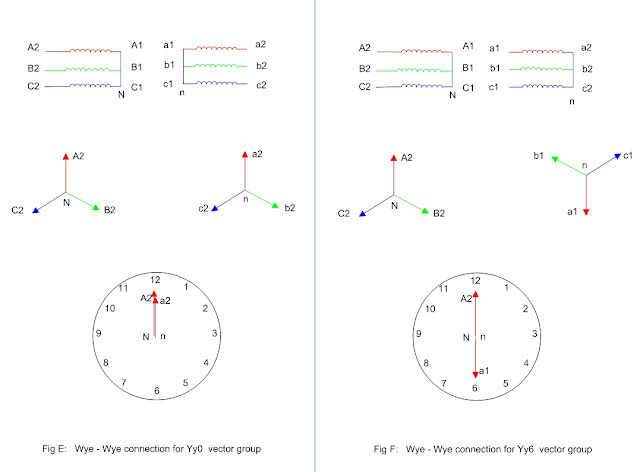 In the above diagram the individual phasors are still the same as in Yd11 case. Here we have only rearranged the phasors of delta side, only to satisfy the connection changes in the secondary side. Here the clock face indicate One O' clock. As a result we obtain the Yd1 vector symbol. Let us consider another important connection, Primary in Delta and Secondary Star connected. Here the primary windings are connected in Delta and the secondary windings are connected in Star or Wye. The naming convention is similar to the Wye-Delta transformer. In the figure-C see how the windings of primary and secondary sides are connected in Delta and Star respectively. Also see the corresponding phasors. In the Delta side each winding is subjected to line voltage, but in Wye side each winding is subjected to phase voltage (V/1.73). As already told and shown, although the neutral is not physically available in Delta side, but neutral point 'n' can be found geometrically . The arrow NA2 is the phasor representing phase voltage of high voltage side (primary). In the Star side(low voltage side) arrow na2 is clearly the phasor representing the phase voltage of low voltage side. From the diagram applying school geometry it is clear that na2 phasor lags NA2 phasor by 30 degrees. So the transformer is identified with Dy1 symbol. Similarly just slightly modifying the connection above we can get Dy11 notation. Here we have rearranged the windings in the primary side for connection modification and convenience. See Fig-D. If you understand the above examples then identifying Star-Star and Delta-Delta vector group are very easy. One can reasonably say that the phase difference between the primary and secondary sides of both these cases is zero. The vector group symbols will be Yy0 and Dd0. Remember the connections can be two different ways. Consider the Wye-Wye connection. In Yy0 (zero phase displacement between primary and secondary) secondary side neutral is obtained by shorting the terminals a1, b1 & c1 and a2,b2 & c2 are brought out terminals. In Yy6 (180 degree phase displaced) the neutral is obtained by shorting a2,b2 & c2 and a1,b1&c1 are brought out terminals. See Fig-E and Fig-F. Undoubtedly transformers belonging to the same group can be operated in parallel without any difficulty. It is impossible to run in parallel, transformers in Group1 and 2 with transformers in Group3 and 4.You consider any one from group 1 or 2 and any one from group 3 or 4 and see the phase difference, which inhibit their paralleling. Also transformers in group1 and group2 cannot be operated in parallel as there is 180 degree phase difference between the two secondary windings. This can only be rectified by changing internal connection. Similarly if group3 and group4 transformers will be connected in parallel then there will be 60 degrees phase difference between their secondary windings. But with transformer external connection modification the phase difference of secondaries can be made zero. So group3 and group4 transformers can be operated in parallel with some external modification. It seems that this is not true for the YNd9. I can't seem to explain why. In other words, I thought we could do the clock convention from the line-to-line voltage. I read your post. Really it's a interesting post by you.Thanks for all the reviews you write about Voltage Transformer. This are more helpful for all. Really useful but no zigzag connections?? Could anybody explain to me Dyn5 vector notation? Some transformer manufacturers are using this vector group. can any one tell me what is the requirement of phase differences in between the primary & secondary windings of transformer, is it possible to design a tranformer having vector group YNd0 or Dyn0. This was really useful.. Thank you very much..!!! from delta- wye connection stepdown of transformer, can i use wye connection in the secondary side with floating neutral? will it be critical to equipment? It is not possible to have zero phase difference with YNd or Dyn windings. Use YNyn or Dd windings. This should not be needed if all transformers are the same vector group. Very good technical details SIR. Standard Transformers is a private limited company engaged in manufacture, testing of Transformers & Rectifiers Stabilizers in the voltage class. Thanks to you for share tips and knowledgeable information about transformer. this was great...thank you so much. Can Ynd11 transformer be used as a replacment for Dyn11...what will be the consequences? Elect Power Inc basically Electrical Transformers manufacturers based in Canada deals world wide. We Provide complete range of Electrical Transformers. Thanks mate, this is useful information that I need to know and is not covered in my textbook. What is the vector group designation for a Delta:"modified" Zig-Zag with -15 degree phase shift as opposed to a Delta:Zig-Zag with 0 degree phase shift Dzn0? thanks a lot for this tutorial..
Can someone explain how to identify the vector group looking at the winding connections. 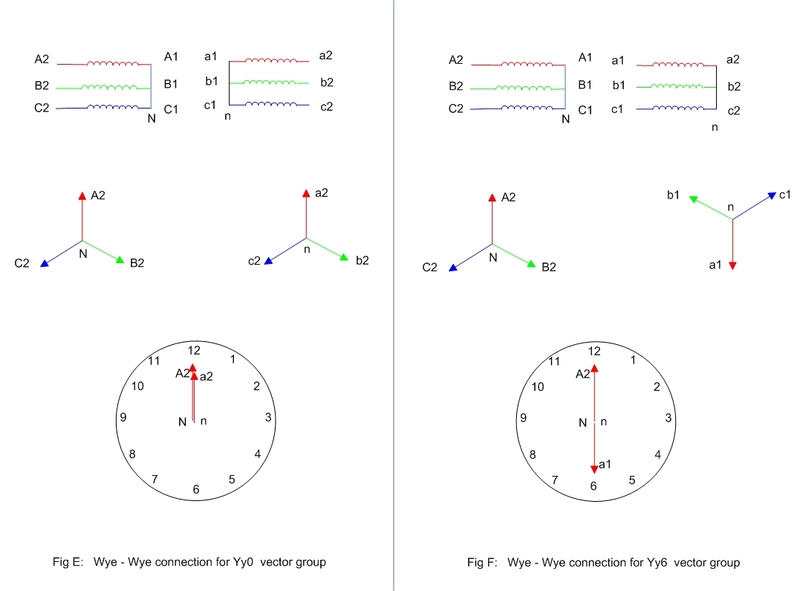 In the reverse, how to connect the 3 phase windings for a given vector group, taking an example of Yd11 or Yd1 shown on website. I will be grateful. Plz can anybody say.how to check vector group in site without having R & D name plate... please share Ur voluble knowledge.. 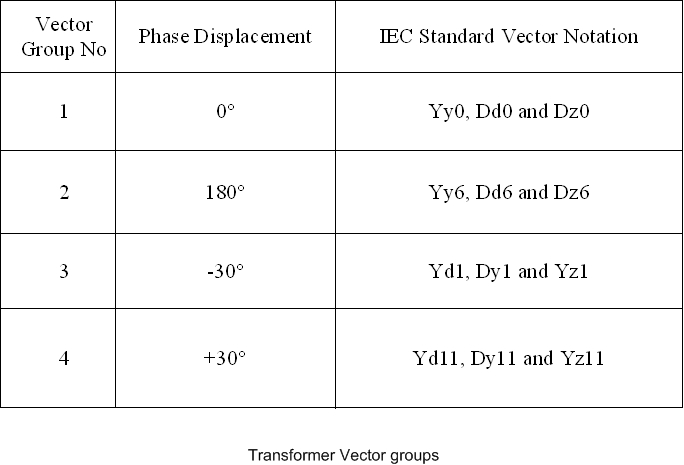 Thanks for elaborating on Transformer Vector Groups. These diagrams have made it easy to understand the connections with simple easy methods. kapan kita gunakan tiap2 jenis gulungan trafo, misalnya delta > star dst.